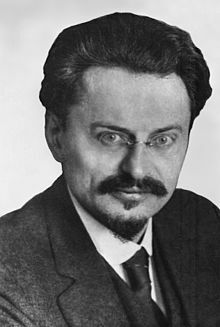 Leon Trotsky (Roushie: Лев Дави́дович Тро́цкий (help·info), Ukrainian: Лев Дави́дович Тро́цкий (Lev Davidovich Trotsky, an aa transliteratit Lyev, Trotski, Trotskij, Trockij an Trotzky); 7 November [A.S. 26 October] 1879 – 21 August 1940), born Lev Davidovich Bronstein (Roushie: Лев Дави́дович Бронште́йн), wis a Roushie Marxist revolutionary an theorist, Soviet politeecian, an the foonder an first leader o the Red Airmy. Trotsky wis ane o the leaders o the Roushie October Revolution, seicont ae tae Vladimir Lenin. Durin the early days o the Soviet Union, he servit first as Fowkcommissar for Foreign Affairs an later as the foonder an commander o the Red Airmy an Fowkcommissar o War, he wis a major figure in the Bolshevik victory in the Roushie Civil War. He wis amang the first memmers o the Politburo an aw. Efter leadin a failed struggle o the Left Opposition against the policies an rise o Joseph Stalin in the 1920s an the increasin role o bureaucracy in the Soviet Union, Trotsky wis successively remuivit frae pouer, expelled frae the Communist Pairty, deportit frae the Soviet Union an assassinatit on Stalin's orders. An early advocate o Reid Airmy intervention against European fascism, Trotsky opposed Stalin's peace greements wi Adolf Hitler in the 1930s an aw. As the heid o the Fowert Internaitional, Trotsky continued in exile tae oppose the Stalinist bureaucracy in the Soviet Union, an wis eventually assassinatit in Mexico, bi Ramón Mercader, a Soviet agent. Trotsky's ideas form the basis o Trotskyism, a major schuil o Marxist thocht that is opposed tae the theories o Stalinism. Trotsky's hoose in Coyoacán wis preserved much as it wis on the day o the assassination an is the nou a museum run bi a buird whilk includes his grandson Esteban Volkov. The current director o the museum is Carlos Ramirez Sandoval. Trotsky's grave is locatit in the gairden on the grunds. A new foundation (Internaitional Friends o the Leon Trotsky Museum) haes been organisit for tae raise siller tae further improve the Museum. Trotsky wis ane o the few Soviet poleetical figurs who wis niver rehabilitatit bi the Gorbachev admeenistration. Trotsky wis rehabilitatit in 16 Juin 2001 on the basis o the decision o the General Prosecutor's Office. Trotsky's grandson, Esteban Volkov, who lives in Mexico, is an active promoter o his grandfaither. Trotsky's great-granddochter, Mexican American Nora Volkow (Volkov's dochter), is currently heid o the U.S. National Institute on Drug Abuse. ↑ See, for example, the letter publisht in the Internal Bulletin o the Communist League o Americae, no.11, 31 Mairch 1933 "Leon Trotsky: Germany and the USSR (1933)". Trotsky Internet Archive. Retrieved 2009-06-25. Wikimedia Commons haes media relatit tae Leon Trotsky.